Two very exciting updates for everyone! One, Shiseido The Collagen is officially here! 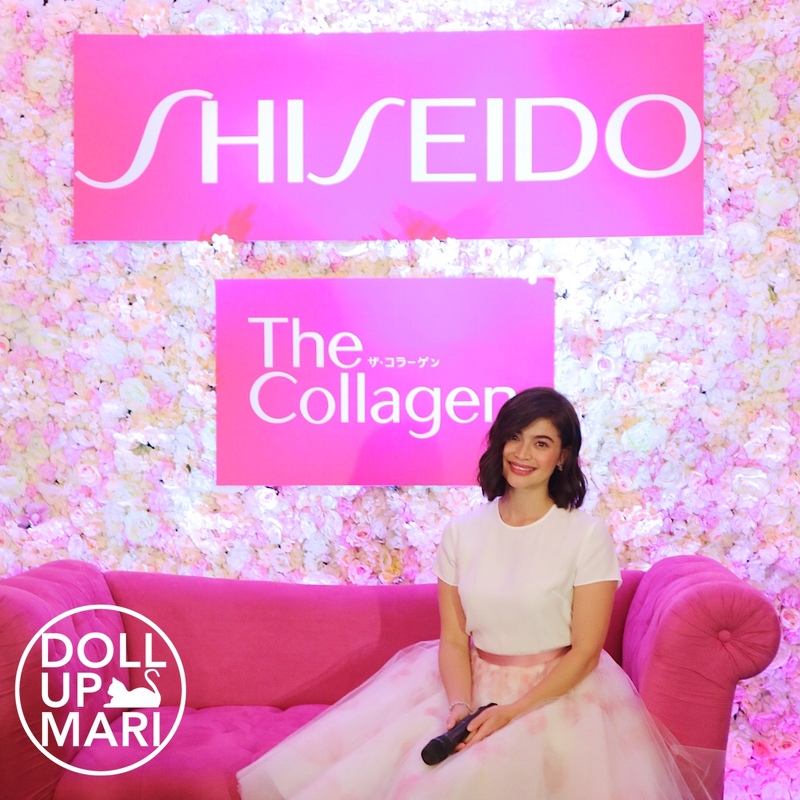 Two, Anne Curtis is the face of Shiseido The Collagen! Anne Curtis was definitely the best choice of endorser for this because she radiates an unexplainable energy that just draws you to her. She's sooo pretty, but hey, all other celebs are. What really sets her apart is her infectious personality, this invisible glow emanating from her aura. 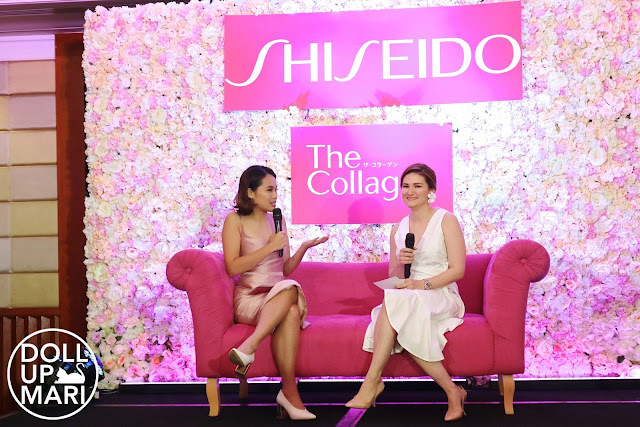 Shiseido The Collagen is all about repairing broken tissues from within in order to fight acne and aging and pigmentation, to promote lightening and brightening of the skin, and to tighten and tone the pores. The end result is a holistic glow and aura. 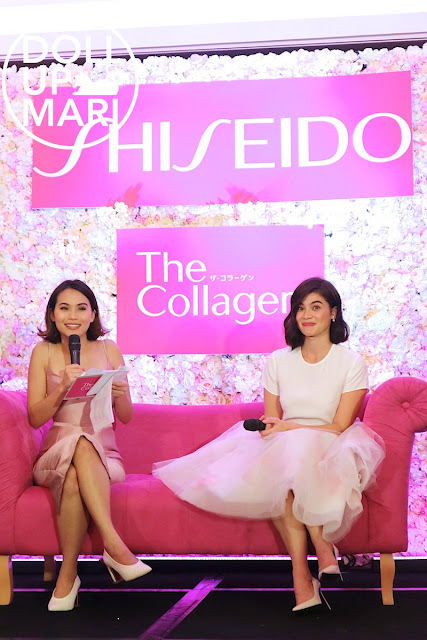 When I started sharing about these products on social media, a lot of my friends contacted me personally just because they were so excited about the arrival of Shiseido The Collagen. I think Shiseido The Collagen has been peddled by online sellers since time immemorial. 2014 is the earliest time I can name. And despite the premium pricing, there is just something so unexplainably special about collagen that makes people want to never stop using it. Personally, I have tried taking collagen for several months a few years ago. I'm generally so pale that's why I couldn't really see myself brightening or starting to glow. But what I found to be so groundbreaking about collagen supplements is that the supplements got rid of the crazy fluctuations. I think all girls can relate to me in the sense that our skin is affected by our menstrual cycles in one way or another. It depends from person to person, but there will always be a certain time of the month that our skin is bad just because of the time of the month. Some people experience it before their periods, some during, and some after. For me, I usually experience problems about 1-2 weeks before my period. And then after my period comes, weeeeeeee my skin is suddenly OK again even without doing anything. Being on collagen supplements for a few months, I really noticed that my skin wasn't as affected by such cycles and was generally kept in a good status most of the time. Of course, this was also paired with constant and consistent skincare usage. But overall, I feel that this will be very good for those who are looking for a long term and holistic solution to stabilize their skin's condition. So here's a photo of their collagen shot. 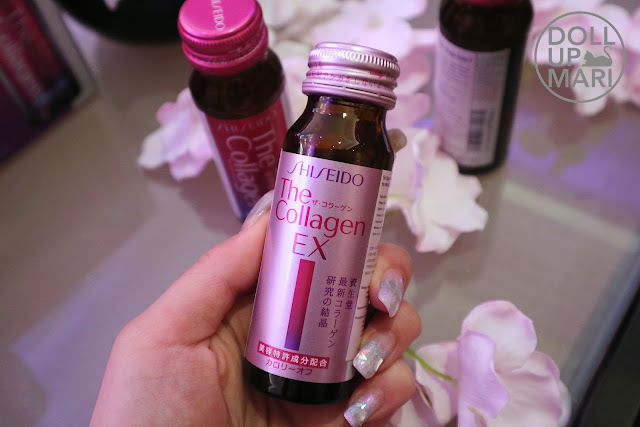 And for those who are looking for more help, they also have Shiseido The Collagen EX. They also have powder! I'll talk about pricing and some more information later on this post. And here's our lovely host for the day. They invited Dra. Anna Palabyab-Rufino (MD, FPDS) to talk about collagen in greater detail. She explained that collagen is indeed found in our body as it's used by our body for cell repair. It's the protein in the extracellular space (of our cells), so there's actually a big role that collagen plays in our lives even if our science classes have not told us such. Collagen can be acquired through our diet (there are plenty of foods that are rich in collagen), but of course, it can be quite cumbersome for the (extremely stressed, busy, overworked) people of today to acquire a diet that has a good amount of collagen. I mean, most of us aren't even eating proper meals, what more a whole diet focused on harnessing collagen? That's where Shiseido The Collagen comes in. Shiseido The Collagen makes it easy for consumers to consume a big amount of collagen without having to sort through so many foods. Dr. Rufino explained that there is no overdose of collagen so it's OK to drink a lot. More of there is just a plateau on the effects when you've taken more than what your body needs for a specific period of time. 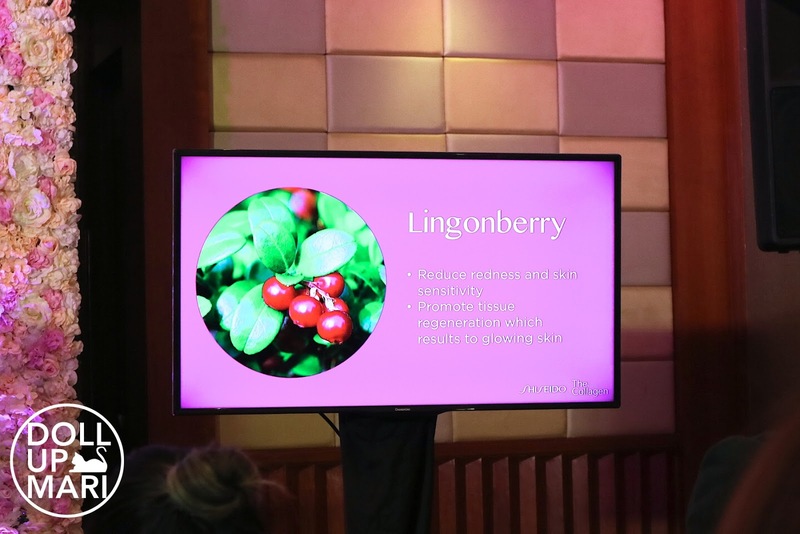 What makes Shiseido The Collagen special are Lingonberry and Indian Gooseberry. These two berries act together to reduce skin sensitivity, reduce pore size, promote brightening and lightening of skin, and make glowing skin. 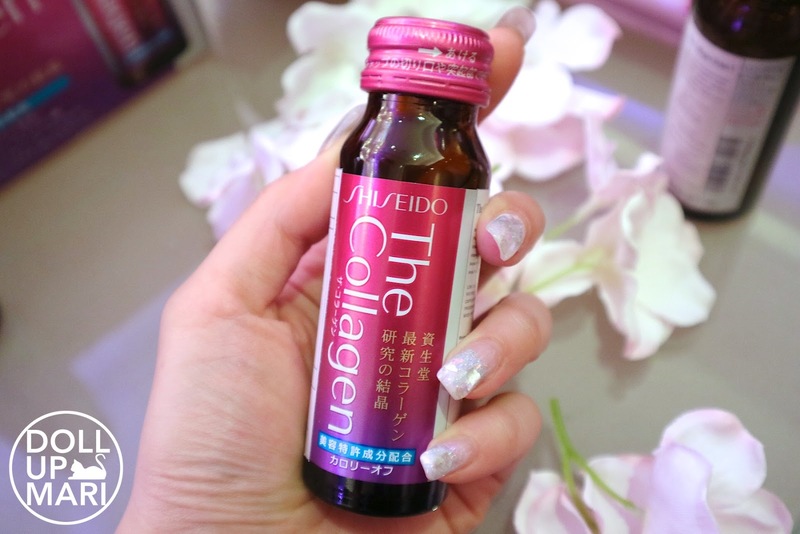 But it's worth noting Shiseido The Collagen also has Low molecular weight fish collagen, Vitamin C, Hyaluronic acid, Vitamin B2, Ceramide, Vitamin B6, GABA, Vitamin E, Ornithine, Royal jelly, Moisture peptide. 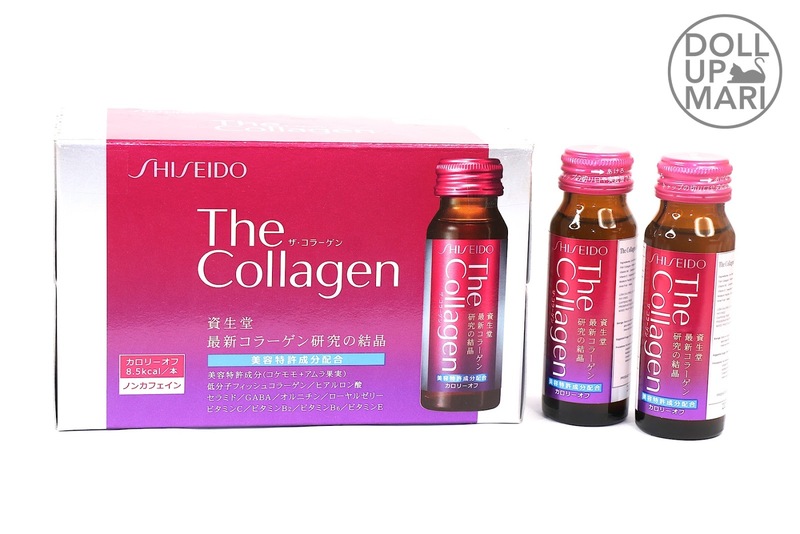 Shiseido The Collagen is basically its own proprietary blend of special ingredients to deliver maximum results. Lingonberry and Indian Gooseberry are very good, but for the full package you'd need the supporting ingredients and not just the two alone. That's why Shiseido The Collagen has got your back with that. And of course, we were just so mesmerized for the rest of the afternoon with Anne Curtis in the house. Her makeup was minimal but she was glowing like a goddess, so the results of the products on her speak for themselves. The best part of having her over is that she has such an infectious, radiant energy. She's also a lot into making funny faces. She's the right girl for this brand because you can clearly see that even with her funny faces, she still glows from within. 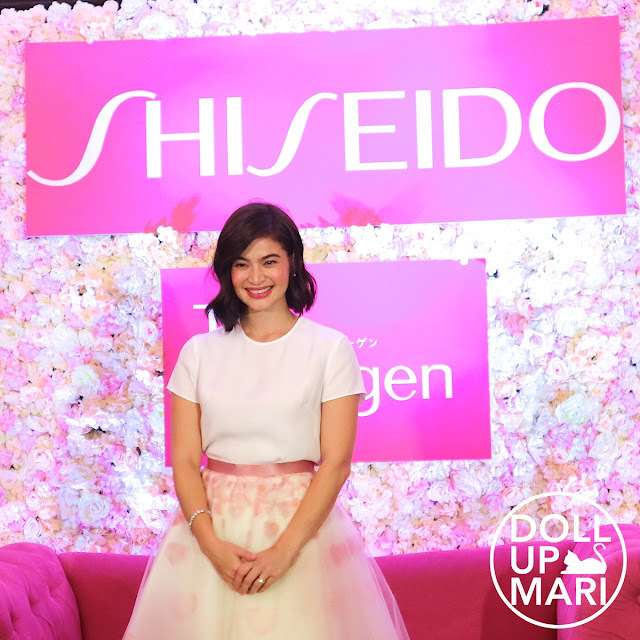 Weeeeell getting engaged to Erwan is perhaos another source of her glow, but the more scientifically proven source would have to be Shiseido The Collagen hahaha. 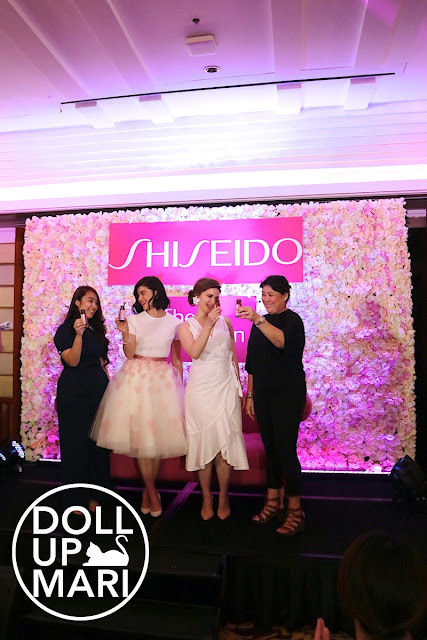 Anne is sharing a toast with Dr. Rufino and key executives of Shiseido Philippines. The most relatable thing Anne Curtis shared was that she too often suffers from little sleep. Her busy schedule means that there are times when she doesn't get sleep for days. She's also seeing some fine lines and wrinkles here and there since hitting 30. 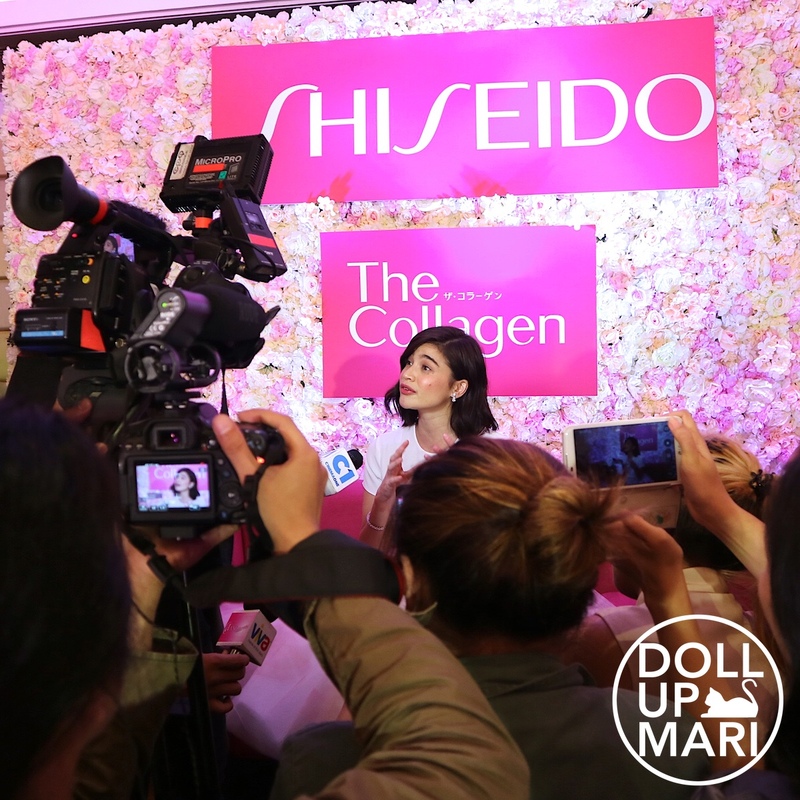 But she knows she's covered coz she's taking Shiseido The Collagen. 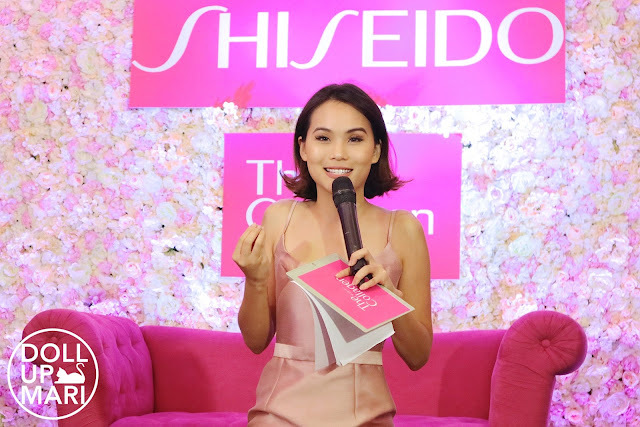 For her, having Shiseido The Collagen is like cheating having not slept properly because you glow so much no one will ever know you didn't have any sleep. She was immediately whisked into interviews because eveeeeryboooody is so excited to learn the latest about her engagement. There were several who asked about her wedding details and she wanted to keep them secret. But for sure, she'll be taking lots of Shiseido Collagen in the months leading up to her wedding for a holistic glow from within. That's what I can say hihihi. As usual, the interview also involved updates on how her K-Drama addiction was doing. Of course, she and her Gong Yoo addiction are going strong. Gong Yoo is just goals that Anne is just basically speaking on behalf of all of us. She's also been enjoying watching Weightlifting Fairy on ABS-CBN. Anne is generally a smiling person (compared to other celebs) and it's so nice to see her excited about things. She's really happy about being selected for this endorsement because she feels that the brand could've chosen so many other people. She's also very happy because this endorsement means she's been receiving a very healthy supply of Shiseido The Collagen, and that she'd no longer need to catch the brand in online shops as the brand is officially here. So here are the product formats of Shiseido The Collagen! 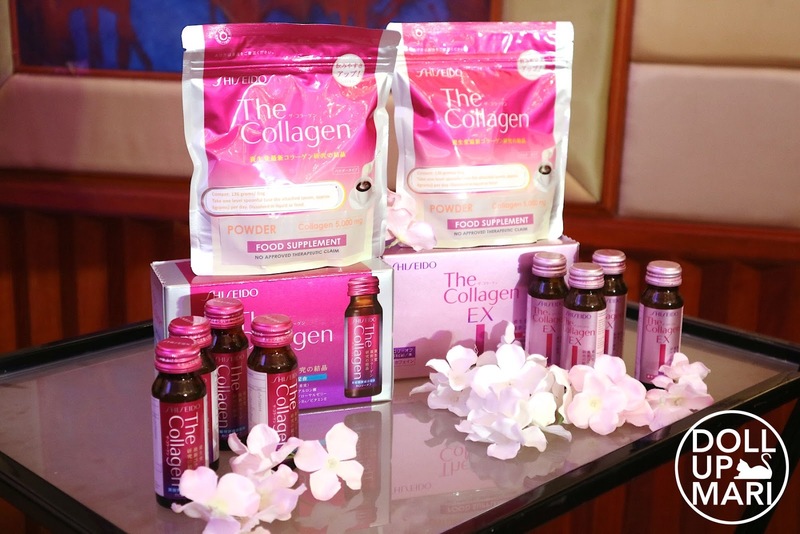 They have Shiseido The Collagen powder (Php2499.50/pouch) which can be mixed onto any food or beverage. Plenty of Japanese people mix this onto their yoghurt. I think there are people who add this to their breakfast oatmeal as well. This is a 126g bag, with a spoon taped onto the back. The brand intends consumers to use the spoon to get a 6g dose everyday for 21 days. This is fat free, and each dose just has 21 kcal. 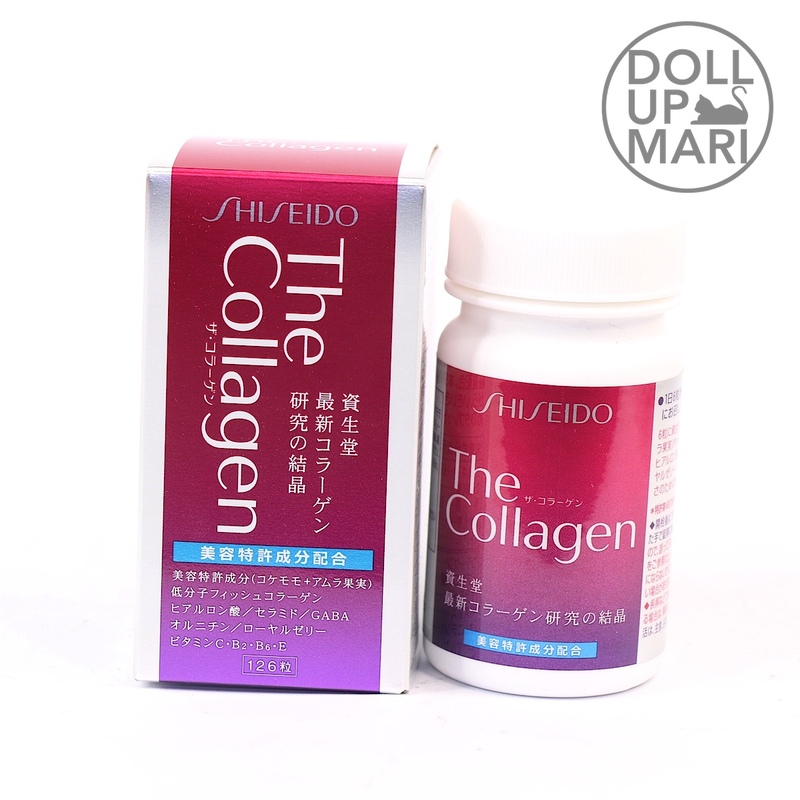 This has 5000mg of low molecular fish collagen, and is enriched with Hyaluronic acid, Ceramide, and Vitamin C.
For those who want the process as quick as possible, you can also try Shiseido The Collagen tablets (Php3499.50/bottle for 126 tablets). Aside from Lingonberry and Indian Gooseberry, this also has GABA, Arginine, Royal Jelly, and Vitamins B2, B6, C and E.
And of course there is Shiseido The Collagen beauty shot (Php229.50/bottle)! This is for those who may not want to have to think about where they'd mix in the powder. Or for those who want a fun and tasty way to enjoy their collagen. 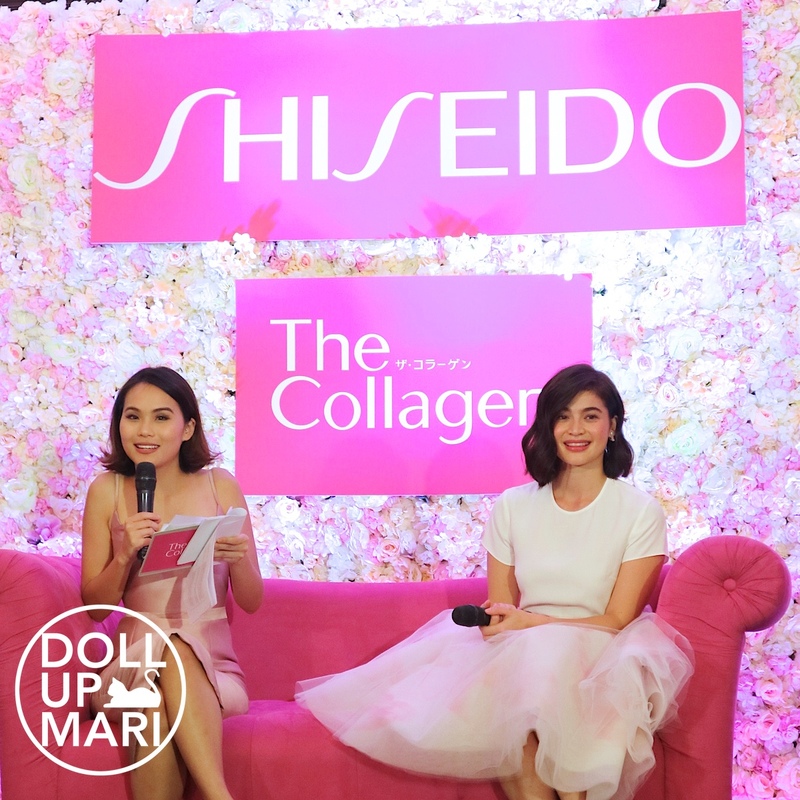 Regardless of what format you use, Shiseido The Collagen is the way to glowing skin.